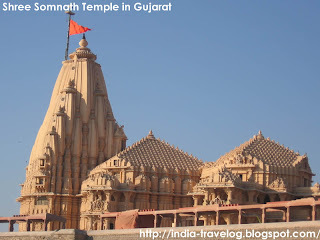 One of the most sacred of the twelve Jyotirlingas is the Somnath Temple in Gujarat. The temple is called as the “Eternal Temple” because it has been destroyed numerous times and rebuilt grandly each time. We caught a bus from Veraval, which is 5 kms from Somnath. The bus dropped us in very close vicinity of the Somnath Temple Complex. It was the holiday season and all the guest house/hotels were booked. We took the help of an auto driver to help secure a guesthouse. After freshening up, we headed for the temple. Mobile phones, cameras, backpacks are not allowed inside the temple complex. You can leave all these things in the locker room outside. The temple is awesome. Standing tall right on the shore of the beach, it makes for a grand picture. The inner precincts are maintained very well. Security was top notch. There was a sniffer dog in action too. The temple carvings are marvelous and so was the inner sanctum. We went during the time of the evening Aarti. There was a long unending queue of pilgrims. The Aarti was one of its kind. After the Aarti, we strolled around in the temple admiring the architecture. An announcement was made that the Sound and Light Show would start soon and interested people were asked to purchase the tickets. We did so and headed for the open auditorium kind of thing within the temple complex. In the evening the temple is lit up and looks lovely. We could not take any pictures inside but here is one from the outside. The Sound and Light Show was amazing. The Show which has a voice over by Amrish Puri(who represents the Ocean) is a beautifully presented show. The entire history of the Somnath Temple is explained. According to Hindu mythology, Chandra “The Moon God” had married all the 27 daughters of Daksha Prajapati. However, enamored by the beauty of one of his wives “Rohini”, Chandra neglected the other queens. The other queens then went to their father and complained. He was aggrieved to see his daughters in distress and cursed Chandra. Chandra then lost his light and began to wane. On the advice of Brahma, Chandra performed penance and gained a blessing from Lord Shiva. His light was restored to him. In recognition of this, Chandra built the first Somnath Temple in gold. How this temple was destroyed I am unable to recollect, but the second temple was said to be built by Ravana in silver and the third by Lord Krishna in Sandalwood. In the year 1024, Mohammed Ghazni raided the temple and looted it. 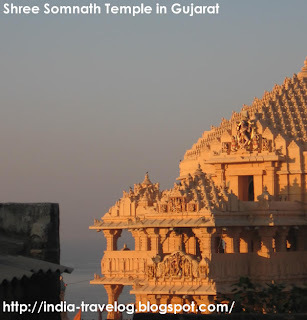 Later Bhimdev Solanki, one of the rulers of Gujarat, rebuilt the temple with wood. Then Kumarpal rebuilt the temple with Stone. The temple was destroyed in 1297 and 1394 when the Sultanate of Delhi subjugated Gujarat. Aurangzeb destroyed the temple again in 1706. The temple was rebuilt every time. Sardar Vallabhbhai Patel, took an oath in 1947 to reconstruct the temple. 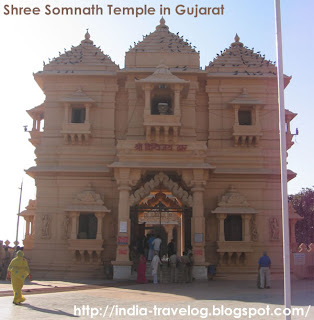 Under his leadership and guidance the present temple was built by the Shree Somnath Trust. 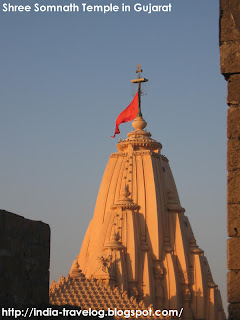 To this day it is maintained by the Shree Somnath Trust. 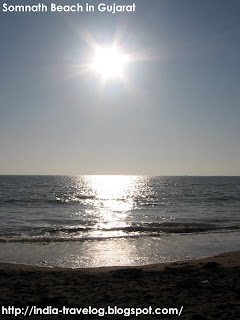 In the evening you can stroll down to the Somnath Beach on whose shore the temple is located. There are lot of camel and horse rides on offer. Corn of cob, boiled/roasted peanuts, fruits and ice gola vendors dot the place. By Air - The nearest Airport is at Diu – around 90 kms from Somnath. By Train - Veraval at a distance of 5 kms from Somnath was the closest Railway station until sometime back. Now I have heard that Somnath has its own railway station. By Road – Numerous Gujarat State transport buses and private luxury buses connect Somnath to all major cities in Gujarat. 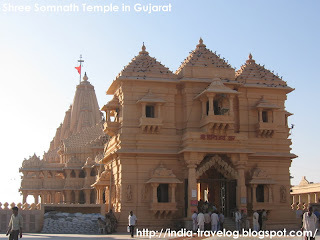 Guesthouse for Pilgrims at Somnath – the Shree Somnath Trust provides guest houses and dormitories for the pilgrims. You can choose from the VIP Guesthouse, normal guest houses and the economically priced dormitories. 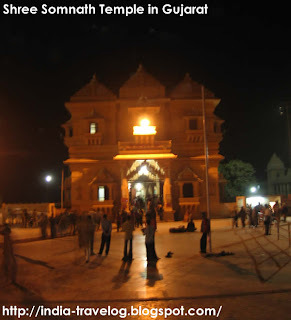 “The Jay Somnath” Sound and Light Show : 8.00 pm to 9.00 pm – Do not miss it if you are in Somnath during the evening hours. Also do not forget to visit Bhalka Thirth enroute from Veraval. People here are very friendly. When compared with places like Ahmedabad etc., all boarding, travelling, lodging is cheaper. Can any one help with info abt importance of South Pole from Somnath? 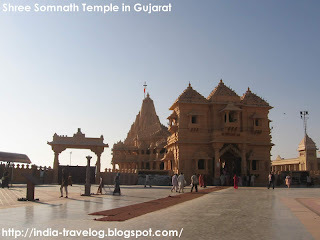 There is a point called the South Pole point at the Somnath temple. If one were to travel in a straight line from that point, one would reach the South Pole without touching land. This is an unique fact about the Somnath temple. There is no such other place inthe world. I am planning to visit on 13 & 14th March 2013, the information provided is very useful please also guide me that where & how should I book a good accomodation in dwarka & in somnath.I am reaching dwarka on 11th March by train.